Three center bit type drill bits. Two are very similar in size and measure approx. 5.5" - 6" in length. The third is smaller and measures only 4.75" - 5" in length and has a smaller head. 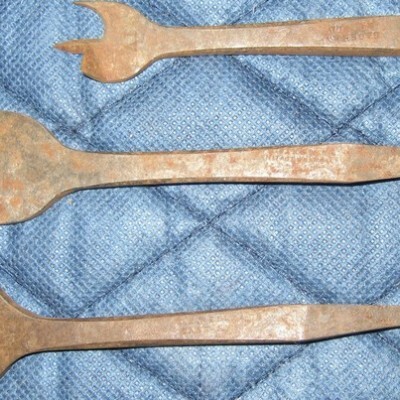 All three bits are rusted. There is a visible maker's mark on the small bit, but it is difficult to distinguish, possibly "Sagshaw"